A partnership is a unique type of business. It's composed of at least two owners, but it could have many owners (thousands, even). 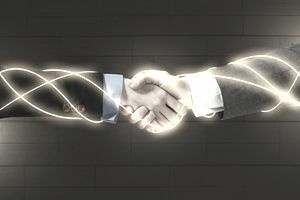 These owners share in the benefits and drawbacks of the business partnership, according to the terms of a partnership agreement that they sign when they join the partnership. To form a partnership all that's required is (1) to register the partnership in the state where it is going to do business, and (2) to create the partnership agreement defining what each partner is responsible for, the different types of partners, how the partners will be paid, and how to handle changes in the partnership. How Does Someone Become a Partner in a Business Partnership? Partners usually join a partnership, or "buy in" by contributing money to the partnership. If someone joins a partnership, they are usually asked to make that contribution. Another track to partnership is to be hired as an employee and after a period of time be invited to join the partnership. A law firm, for example, may have employees, called associates. At some point in time, an associate may be invited to "make partner" by buying into the partnership. Why Have Different Types of Partners? Partners are partners, right? Not so. When a partnership is formed, some of the potential partners may want a different role in the partnership than others. Some want to contribute more money; others may not want to contribute money but want to work in the business for a salary. Some partners are willing to take on more responsibility and more liability, while others may want less responsibility and less liability. Liability in the running of a partnership means individual partner liability for debts of the business and also for actions of the partners. All partners - both general and limited - contribute to the partnership, either at the beginning of the firm or when they join. The amount a partner contributes usually determines his or her ownership percentage of the partnership. But a partnerships ownership percentage has nothing to do with the individual partner's liability. Liability is based on participation in the general operations of the partnership. Some firms have a managing partner, who is responsible for the overall running of the partnership, the day-to-day financial, legal, and human resources functions. The managing partner is given authority to act on behalf of the partnership by the partners, as spelled out in the partnership agreement. Although all partners With the increased responsibility given to a managing partner comes increased liability. Signing legal documents, for example, carries an additional responsibility and liability. What the Difference Between a General Partner and a Limited Partner? A general partner in a partnership takes part in the daily operations of the partnership and is personally responsible for the liabilities of the partnership. In contrast to a general partner, a limited partner is a partner in a partnership who has a share of ownership but who takes no part in managing the partnership. A limited partner is not liable for any amount greater than his or her original investment in the partnership. In contrast to a limited partner, a general partner takes part in the daily operations of the partnership and is personally responsible for the liabilities of the partnership. Limited partners are sometimes called "sleeping partners," because they contribute but don't do anything on a day-to-day basis. Both limited partners and general partners receive a share in profits and losses of the partnership (this is called their distributive share), based on their percentage share of ownership of the partnership, as defined in the partnership agreement. Other lower levels in the partnership may be senior partners, junior partners, and associate partners. Duties and responsibilities vary at different levels. At each level comes more responsibility, including the training and supervision of lower-level partners. Some partners, for example, may be responsible just for legal matters while others focus in gaining and maintaining clients. What is the Difference Between an Equity Partner and a Salaried Partner? Some professional firms have different types of partners, depending on whether the partners participate in the profits of the firm. These two types - found most commonly in law firms and accounting firms - are equity partners and salaried partners. Equity partners have contributed to the partnership at the time they became a partner, but salaried partners do not contribute to the partnership. Based on the provisions of the partnership agreement, partners can agree on a number of equity partners, who have ownership. Their annual compensation is through a Schedule K-1 and is based on their share of ownership and on the profits or losses. The annual compensation of salaried partners, in contrast, is based on salary and sometimes bonuses.